Master Cheng Yen, founder of Tzu Chi Foundation was awarded with the Award of Honor by Rotary International in recognition for her contribution towards the humanitarian spirit and world peace, affirming Tzu Chi’s leadership status in doing charity work around the world; Master Cheng Yen is the first Chinese recipient in the world, in her acceptance speech at the ceremony, she said that she is very grateful; for the implementation of all the charity work done by Tzu Chi globally is a joint effort of the volunteers, she is only representing Tzu Chi volunteers around the world in accepting this the Award of Honor. Rotary International the Award of Honor ranked as the highest honor in the club; Master Cheng Yen was unanimously confirmed by the Rotary International Global Council’s 19 governors from 16 countries to receive this award. Rotary International created the award in 1990, to advocate the eradication of poverty, and to promote world peace as its objective, in recognition of ones contribution to the humanitarian spirit and world peace. Master Cheng Yen is the first in the Chinese world to be awarded with the Award of Honor, over the years, awardees include: Britain's Queen Elizabeth II; former U.S. President Ronald Reagan, Bill Clinton; Microsoft founder Bill Gates; former Soviet President Mikhail Gorbachev and President of India Pranab Mukherjee. Rotary International President Gary C.K. Huang been with Rotary International for a total of 38 years, he has visited many countries in is involved with various process of social service, he found out that when Rotarians are asking recipients if they need any help or services, Tzu Chi volunteers with more experience have already came up with aid and supplies and are way into the depth of assistance. President Gary C.K. Huang said that Tzu Chi Foundation has been doing charity work for many years, their humanitarian projects are touching, it is an honor for Rotary International to give this award to Master Cheng Yen. 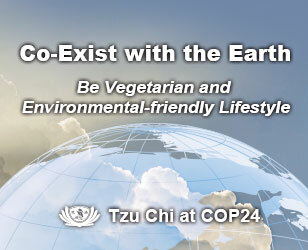 Master Cheng Yen established Tzu Chi Foundation in 1966. With the spirit of self-restraint, diligence, frugality and the will to overcome hardships, Dharma Master Cheng Yen and her disciples started “The Bamboo Bank Era”. The organization has propagated the missions of charity, medicine, education and humanistic culture. Tzu Chi volunteers practice altruistic giving with sincerity and gratitude. They educate the rich to help the poor and aid the poor to educate the rich. From the remote Hualien to five continents, Tzu Chi’s charitable missions have blossomed in 87 countries and regions worldwide. Master Cheng Yen thank President Gary C.K. Huang for this "indulgence", Master Cheng Yen said that this is accomplished by all the Tzu Chi volunteers in their joint efforts. 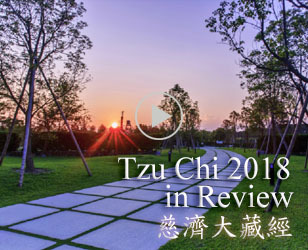 Tzu Chi has been around for 48 years and is well into its 49th year, it shared a common philosophy and objective with the Rotary International, which is to serve the human society and to promote world peace through selfless service. Master Cheng Yen looked forward to the day when everyone can overcome hatred with love and with "sincerity" and "affection" in order to promote world peace. 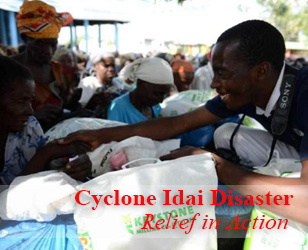 Rotary International is committed to the eradication of poverty, in order to achieve the ultimate peace for mankind, the Award of Honor has emphasized on the value of peace and the eradication of poverty, the Committee of the Award of Honor unanimously endorsed Tzu Chi founder Master Cheng Yen as a model and representative of this noble values.